After more than a decade toiling, perseverers Challengers finally got their hand on the Western Masters League trophy. Challengers, perennial semi-finalists, etched their names on the winners’ list with a come-from-behind 3-1 thrashing of first-time finalists Faithful Masters in the championship game of the Keith/Michael Thorpe League played at Jarrett Park on Sunday. 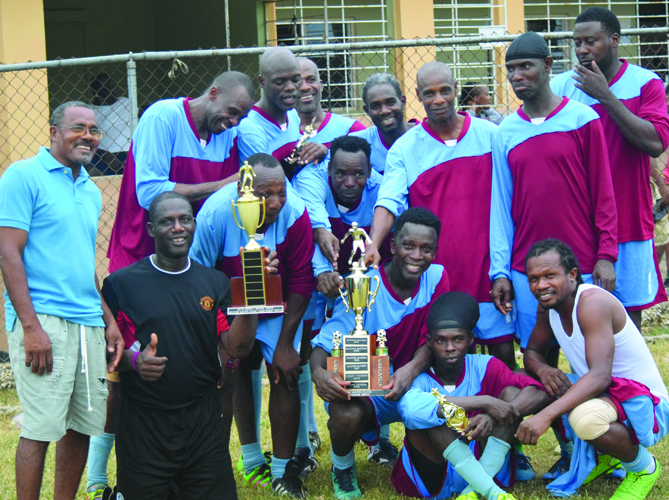 Jerry Foster, Omar Clarke and Philmore Thompson were the scorers for the newly installed champions, while an own-goal was the contributor for the Faithful team. After a brisk start to the finale, Faithful found the early advantage somewhat against the run of play when an own-goal was turned in on 11 minutes to send the unfancied Faithful ahead. However, after falling behind, Challengers upped the tempo and swarmed their opponent’s goal mercilessly, looking for the equalizer. They had a few near brushes before finally leveling the scores through a well-worked build-up. From a three-man play down the flank, Foster got on the end of a weighted cross deep inside the six-yard box to powerfully head home unchallenged between three defenders. The goal pushed Faithful on the retreat as they only just managed to keep the scores level at 1-1 heading into the halftime break. Challengers took the lead 10 minutes into the second half when former Seba United player Clarke, got on the end of an exquisite 35-yard pass and with his opponents caught ball-watching, he slammed home on the run from an acute angle. Nine minutes later, Challenger all but wrapped up the game as a contest when a defensive error saw the Faithful captain, Timothy Graham, robbed of the ball after a deep back pass. The ball was then tapped into the back of the net, sealing the win for the Challengers team to their delight. Meanwhile, the fleet-footed striker Omar Clarke of the champions won the Golden Boot award for his eleven goals (11), while the Most Valuable Player award went to Michael Thompson. This year’s competition, which saw the absence for former many-times winners Hanover Masters, First Choice and Jamaica Brazil, saw a total of 12 teams participating before Cambridge Masters was kicked out.